The most basic questions that many are interested in are: “Whether veneers are safe or dangerous for your teeth? Do dental veneers hurt teeth?” “Are veneers worth it (cost, money)?” “Are veneers fake teeth, permanent?” “Are they good or bad for your teeth” Should dental veneers be considered, as a valuable outlet for many people, which makes it possible to drink plenty of wine and coffee and still did not fear for their teeth, that they turning yellow or become quite dark. Or, is it very good new way to make money on somebody’s dreams to have Hollywood smile at any cost? As we remember back in the 30-ies of the 20th century, teeth of Hollywood movie stars were decorated their teeth special thin ceramic plates that were a perfect shape and color. These so-called structures were temporary. Dentists had not yet been able to think to bond veneer to the tissue of teeth for a very long time. But in the 80?s experts have invented an adhesive (adhesive is a dental glue, with which the tooth can be boned to any material from pottery to metal) technique, through which white plates can be boned to teeth for many years. 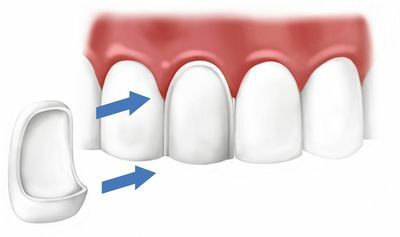 Dental veneers are very thin ceramic plates colored to the desired shade, which are mounted on the enamel with an adhesive, to get ideal form and color. Preliminarily, veneers are made in the laboratories for each individual client, and then later on specially treated teeth (enamel eroded by 0.5 mm and the cutting edge of 1 mm) they are fixed with dental glue. Should you get porcelain veneers? Who needs veneers? Those who have noticeably unsightly or poor quality fillings. Those who have an irregular shape of the teeth, or those who want completely different form of their teeth. Those who have dark colored tooth enamel and it’s not possible whiten for quite a long time. Those who have traumatized teeth, with the uneven edges or damaged enamel surface. Those who have any abnormalities in the definition, for example, incorrect inclination of teeth. Those who have diastema – gap between teeth, which eventually increase further.